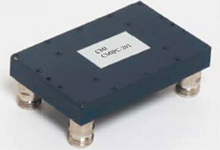 Corry Micronics 90º high power hybrids cover a frequency range from 870 MHz to 2,200 MHz. A 90º hybrid has two outputs that maintain the same output level but the signals on the two outputs are 90º apart. On our hybrids there is a fourth termination or isolation port that absorbs half of any reflected signals from any mismatch on either output. This design effectively protects the input circuit which is typically a transmitter circuit. The Corry Micronics’s high power hybrids are engineered to have a low VSWR and a low insertion loss. Our series of high power hybrids have power ratings of up to 450 Watts. The 90º high power hybrids come standard with a female N connector.